If we thought that Bethenny Frankel’s long awaited divorce settlement would be the last we’d ever hear of Jason Hoppy, we were sadly mistaken. The saga continues for The Real Housewives Of New York star and her ex-husband. Both will be headed to court in April over allegations that Jason was harassing and stalking Bethenny – charges that he was arrested for in January. 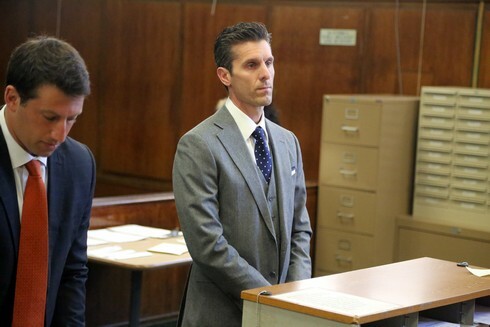 After allegedly threatening Bethenny (who was with her boyfriend Dennis Shields) at their daughter, Bryn’s, school in January, Jason was charged with aggravated harassment in the first degree, harassment in the second degree and stalking in the fourth degree. This incident came after Bethenny accused Jason of sending her approximately 160 threatening emails. Now, Jason is refusing a plea deal to settle these charges. He was offered this deal in exchange for taking anger management classes, which he has refused. How Much Is Bethenny Frankel Worth? Did Jason Hoppy Try To Trick Bethenny Out Of Her Tribeca Apartment? Thanks to court documents stemming from the nightmare known as Bethenny Frankel and Jason Hoppy‘s divorce, we have been given an inside look at the Real Housewives of New York star’s finances. According to the documents, Bethenny had a net worth of $22 MILLION, with assets valued at nearly $612,000, when she and Jason signed their prenup in 2010. And this was before Bethenny sold Skinnygirl for a reported $100 million. At prenup time, Jason was reportedly worth $475,000. Two years later, Bethenny‘s gross annual salary was listed as $4,011,726 on her W2 forms. At that time, Bethenny and Jason each had their own checking and savings accounts, a joint checking account, a joint brokerage account, and a 529 college savings account for their daughter Bryn. There are bad lawyers and there are good lawyers. And then there are Jason Hoppy & Bethenny Frankel’s lawyers, who at this point must be billionaires from handling the multi-year Divorce From Hell the couple is battling out in the press, among other places. Like reality TV. According to pagesix.com, Jason’s legal team is firing back at accusations that Jason will be seeking more child/spousal support from Bethenny in the divorce settlement. He’s already receiving 10K per month, but some reports have surfaced that he wants more. Not so, say his lawyers. “The recent stories . . . are inaccurate and false, seemingly planted by misguided people who wrongly believe that they are furthering Ms. Frankel’s newly minted effort to cast herself as a victim, like when she recently called herself ‘homeless’ on national TV. Mr. Hoppy continues to work hard to protect his daughter from what appears to be her mother’s inability or unwillingness to put a clamp on uninvited media attention,” commented Jason’s attorney, Bernard Clair. Could this finally be the end for Bethenny Frankel's on-going divorce and custody battle? It seems like Bethenny and her estranged husband, Jason Hoppy have been going at each other for years….Oh, wait. They have! Bethenny and Jason separated way back in December 2012. Since then, they have been fighting over everything from their dream home to custody of their 4-year-old daughter Bryn. After months upon months of fighting back and forth, a judge finally ruled this week that a trial is set for next Wednesday. Everybody get ready, cause this could be nasty! Being a Skinnygirl isn't all it's cracked up to be! According to TMZ, Bethenny Frankel has just been ordered to pay her ex-husband's legal fees in their ongoing divorce. Bethenny filed for divorce WAY back in January 2013, but she and her soon-to-be-ex, Jason Hoppy, have been squabbling over money, custody and their luxurious apartment ever since. Now Bethenny has been ordered to cough up $100,000 to his lawyers. The payment is to be subtracted from whatever financial settlement they reach — if they ever reach one. Bethenny Frankel is moving on up….or at least — according to In Touch Weekly — out of her dream home, the apartment that she bought with her soon-to-be ex-husband, Jason Hoppy. The former Real Housewives of New York star filed for divorce in in December 2012 just shy of the couple's three year wedding anniversary, but continued to live with Jason in order to share parenting duties of their daughter, Bryn. Can you say awkward?!?!? Especially since she is in a new relationship with financier Michael “Mac” Cerussi III. Probably time to pack up and leave. Both Bethenny and Jason came out swinging filing for sole custody and refusing to leave their luxury loft that they bought together. Now, I am not choosing sides, but the $5 million, 3,400 square foot loft was bought after she sold her Skinnygirl cocktail company for a reported $120 million. Just sayin.